It’s been three years since I was anxiously preparing for how things would go when I went on maternity leave, including stashing away some extra money since almost half of it was going to be unpaid for me and two weeks unpaid parental leave for Greg. After having Arianna, I got six all too quick unpaid weeks off then headed back to work. With Evan, I took eight weeks and felt a bit better physically and mentally – but admittedly I cashed in a retirement plan in order to make ends meet. Once we had the twins, it was 11 weeks off due to complications post c-section and postpartum anxiety. Part of that was brought on by my feelings of being out of financial control for so long! Even though we’re not preparing for any more parental leave, this article came across my radar this week and I feel it’s super important to talk about! Once you’ve read, head to the comments section and tell us about your parental leave experiences. An analysis of demographic data in Pennsylvania released today reveals the significant and growing need for a national paid family and medical leave plan that covers all working people in the state for the full range of serious caregiving and medical reasons. The release kicks off a series of nationwide activities marking next Monday’s 25th anniversary of the federal Family and Medical Leave Act (FMLA), which provides unpaid leave. Across the country, working people, businesses, lawmakers, advocates and others will come together on the ground and online to celebrate the law’s progress, recognize state and private sector innovations and call for a national paid family and medical leave policy that advances the movement for more equitable and family friendly workplaces. Despite the look of the girls in the photo, they have totally rocked their first years (almost THREE) of life, challenging everything we thought we knew about parenting based on our older two. We’re no experts but have come up with a list that can be helpful if you’re navigating this twin parenthood thing for the first (or second) time. Kudo Banz provided me with product in exchange for my honest review. All opinions are 100% my own. This fall, The Bigs went back to school and learned about their new rewards program – SOAR. Instead of moving from green to yellow to red [on a behavior chart], they now have to earn four levels of getting caught being good. I was surprised when the kids came home complaining about this. “It’s going to be too hard” and “It’s not fair” rang from their throats. I shook my head. Did our time giving Kudo Banz a try this summer not teach them anything? I reminded them of earning their Kudos and they quickly quieted down. And in the three weeks since school’s started? I haven’t heard another word. I think it has worked – Kudo Banz set my kids up for success with this new program! Since we haven’t talked much about the Kudo Banz, you might be wondering what I mean by this. A “parenting game changer”, these are wrist bands that kids wear then earn charms (Kudos) throughout the day for doing good things. Think of it as a sticker chart but constantly there as a reminder. There is a starter kit that has two Banz and a few star Kudos, but then you can also order additional Kudo collections to add to their fun and motivation. My kids opted for the Pirate and Princess sets (but of course) to motivate them. Amanda and Hamza, whom I got to meet in person at Blogger Bash, know that parenting is a challenging but important job. They created this reward system to combat all of the negative messages children receive (like time outs and being yelled out). The Kudo Banz became a tool they could use on the go and for reinforcing positive behaviors. It worked with their three children, and they’re hopeful other parents will find them helpful! How Did Kudo Banz Work for The Bigs? Our experience was pretty positive. The first few days were a bit of a growing pain, but the starter kit we got came with a book that we read a few times as a reminder. This book chronicles the story of two boys who get a visit from their grandma and learn that they need to be good and helpful to earn Kudos…then good things happen. We’d pull it out and read when Evan would get upset that Arianna earned her reward wheel first. But you do not remove a Kudo! No matter how upset he’d get, he got to keep his kudos. We’d just remind him to BE GOOD. Because Evan’s broke, Arianna sort of lost interest, but when things start getting tough, I mention them and they both remember the basic concepts. We’ll definitely want to start these early with the twins! If you are interested in learning more, check out kudobanz.com or get started by adding them to your Amazon cart here. This post is a partnership between myself and UnitedHealthcare talking about kids’ lunch. All opinions are 100% my own. Is mealtime a struggle in your house? It is in ours, mainly because we have six different appetites to please. As much as we want to say we don’t, the truth is that we are often making four different meals. There is the adult meal (Keto or Whole30), Arianna’s mostly grownup meal (but considerations need to be made for her expander), Evan’s “scoop of peanut butter and apple slices”, then whatever the twins eat. I’m exhausted typing it, can you imagine the scene while making these? Torture, indeed. We’re all about healthy choices, but truth is, we parents do need to give our kids something they’ll eat. Having a meal plan and routine will help avoid our efforts going to waste – studies show “that children are throwing away roughly 25-45 percent of food, with vegetable waste up to 90 percent” (source: United Healthcare). That’s alarming to a mama who pinches pennies and tries to push the veggies! My tried and true mom tips are to have the kids pick out what they want to eat, and hope for the best; however, that’s lead to plenty of wasted food in our house. I know. It pains me. That’s why I was excited that UnitedHealthcare was willing to share some tips to make fun, healthy lunches without spending too much time or getting stressed out. =&0=&When kids are engaged in the process, they are more likely to help pack a meal they will eat and it’s a great teaching opportunity for parents. This post is a review of the Freeloader Child Carrier. I received product in exchange for my honest review. All opinions are 100% my own. A few weeks back, I hinted that I’d be getting a child carrier that would be useful not just for the twins but for The Bigs, too. Do you remember me telling you about the Freeloader? Well, it arrived and we’ve been using it to test our backs out for when the twins are big enough to use it by taking Evan up to the Rails to Trails right off our backyard. Like anything new, The Freeloader takes some getting used to. “You’re not going to run with him on here, that’s for sure,” said Greg when he tried it out with Evan. It’s true. I got pretty sweaty while wearing it and even though I know I’m strong, it still was a core workout. We’re not going to be signing up for any 10-mile hikes while wearing it anytime soon. While I was carrying Evan on the trail, I wondered what people thought. The three girls were walking around and I was carrying Evan, the sportiest of them all. But then I didn’t care. It’s pretty cool to have a carrier that supports a bigger child – and my mind went to friends who have kids with special needs, how it would allow them to go on adventures, too! Great news, Freeloader has a community for parents of kids with special needs! They’re steps ahead of me. The girls can’t wait to be worn again, and we’ll work up to bigger adventures than just our trail. The Freeloader Child Carrier is slim enough we could take it to amusement parks or festivals (it only weighs 5.8 pounds). It is lightweight but sturdy. The straps around the hips and around the shoulders distribute the weight evenly. I ordered a medium Freeloader, and it is just the right size for me and for Greg, even with our height difference. The foot straps for the kiddo! As our kids grow, they’ll still be able to use it, up to 80 pounds. Arianna’s even taken a ride! Cars with Space for Three Car Seats: What Do You Do? This post about searching for cars with space for three car seats is brought to us today through US Family Guide and cars.com. When we found out we were having twins, it was clear that a family of six wasn’t going to fit in our Avenger. We tried for a few months, but it didn’t work out like we thought (“we’ll never have to have all four in the “car” and can use the truck instead”, ha). Our search began for cars with space for three car seats. This search is pretty difficult – so much so that Jennifer Newman of cars.com calls it “the automotive holy grail: a car that’s not a minivan and can fit three child-safety seats across the backseat”. That is true indeed! The obvious was that a van was going to work, especially because we have four kids. But even now that we’re looking for a second “runner” vehicle, I’m pleasantly surprised that there are sedan options, too! I found this super helpful article from Cars.com that listed the results of their tests of cars with space for three car seats and LOVED to see five sedans made the list. We’re at the stage where Evan needs a booster and the twins are in forward-facing seats, so the space is still a bit tight. We might not end up with a vehicle that actually fits three across the back (especially because Arianna still needs to be in the back, too), but at least we know our options! When you are looking for a new car, it definitely is a good idea to do your research. The dealer we recently visited encouraged us to check the car seats on a test drive, too. We’ll definitely do that as we move forward in our car buying process! If you’re looking for how other cars passed the car seat tests and you aren’t a big family, Cars.com has information on that, too! 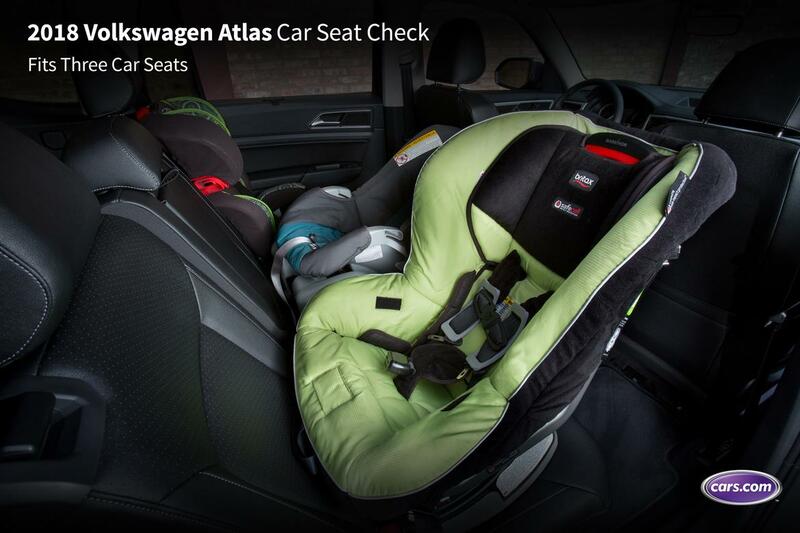 Check out the results of car seats in several different vehicles here. Unsupervised Play: Yay or Nay? This post about Unsupervised Play is brought to you through a collaboration with myself and The Genius of Play. All opinions are 100% my own. This morning I was working from home and got to experience the joy of listening to my two older children as they were playing in my son’s room. The conversations they held sounded very “grown” – such as “make sure the baby has a clean diaper” and “I’ll cook dinner so you can take a break tonight”. Surely modeled after the example Greg and I give them, their simple act of playing house (with Evan’s firefighter house and characters) spoke volumes to me. They know how to play and we are teaching them good things. Where was Greg during this play? He was feeding the twins their breakfast in another room. Where was I during this play? I was working in my office across the hall from Evan’s room. Shock! Our kids were engaged in unsupervised play…and not only engaged in it, they didn’t have to be told to just go play! In our house, unsupervised play is any play that takes place when an adult isn’t in the same room. It challenges them to fight off boredom and to make up ways to interact with each other without the help or influence of us adults or technology. Honestly, it helps us to get our to-do lists and work done, but that doesn’t mean we aren’t listening/checking in. Unsupervised play is showing our kids that we trust them (and letting them know when they’ve broken that trust). But what about when that play is outside and unsupervised? Again, all parents are going to have opinions. When The Genius of Play posted the video below on social media, it gained many comments on the topic. Things sure are different than they were in the 80’s and 90’s when I grew up, but we keep our boundaries pretty tight around here, too. As you know, we let them explore the wild but with our supervision. When they do get to go outside and have unsupervised play, I (imagine) they are pirates and princesses, braving the “wild seas” of our backyard. We have a fenced in backyard, but the kids don’t get to run out back whenever they want – we need to be downstairs so we can see/hear them. Will that change as they get older? Honestly, likely. We’ll trust them more and give them a little bit of freedom. But for now, our unsupervised play will continue to take place within the four walls of our house where we can check in on them every ten or so minutes. Tell me – what are your thoughts on unsupervised play in and outside of the home? I’ve teamed up with The Genius of Play to help raise awareness around the vital role play has on kids’ lives and development. They are currently sharing this set of videos to bring awareness of some hot play topics to the table – head out and see what you think! Let’s help each other navigate the world of parenting. Stay on top of your parenting game when it comes to play! Follow along with The Genius of Play on Facebook, Twitter, and Instagram. Their website is full of creative ideas and advice on play – be sure to check it out!